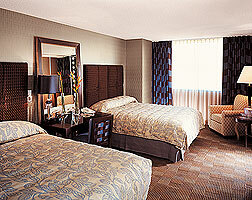 The New York New York offers a range of room options, with each one offering all you could need for a stay in Las Vegas. You’ll find large rooms, marble and granite bathrooms, flat screen TVs and iPod docking stations in all rooms – meaning all you need to bring is your suitcase! The standard rooms are called ‘Park Avenue Deluxe’; and you can choose from one king sized bed or two queens – and you’ll experience great views and lots of space. Other room choices include a number of suites – from the Marquis Suite, which offers more room, a dining area and a whirlpool bath big enough for four people – to the Players Suite which is especially designed for those visiting with playing poker in mind! The Ziggurat Suite has its own wet bar – perfect for a cocktail before your night out – and there are even penthouse suites available!